With the Walsh & Simmons "Solid Standards" line, you can get favorable pricing on the most popular solid surface colors from LG Hausys. The 8 colors shown below are all part of the Solid Standard program. 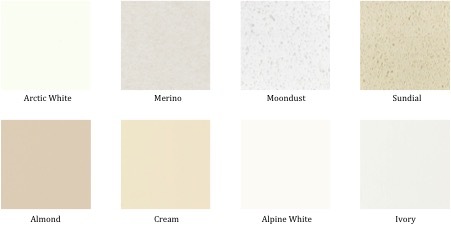 In addition, we can quote any other color from LG Hausys or any other solid surface manufacturer you select (Corian, Avonite, and more).